Process Group | Mitchell Scientific, Inc. Emissions Accountant has been developed to help streamline the task of tracking process emissions as they apply to pilot plant and standard factory process operations. 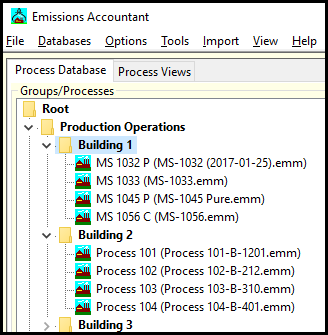 Each process in the factory is first modeled using Emission Master where the calculated emission data is then imported into Emissions Accountant where data contents are linked to one of the factory processes that has been declared in the system. As more and more processes are imported into the system, Emissions Accountant becomes a comprehensive air emissions data repository for the manufacturing facility. Production campaigns or batch records from the factory can be entered for any of the processes that have been brought into Emissions Accountant from Emission Master. Once all of the manufacturing processes and production records are represented, Emissions Accountant can be used to create air emission inventory reports for any calendar time period that contains production data. 1. Batch Production. This data resource is normally reserved for storing emission records from specific batches that have been run on a given calendar day. The emissions for a batch record can be defaulted to the standard emission date set for the process (when the process was originally declared) or they can be represented by a unique emission data. 2. Period or Campaign Production. In the general case, the factory may produce many batches from the same chemical process over a defined period of time. An entire series of production records may be entered into the system. Emissions Accountant can automatically enter the batch production records into the calendar for the period. The emissions for each batch are defaulted to the same standard process emissions data set. Reports can be made for a selected process or a group of processes. All reports are accessible from convenient windows and are created as Excel files using different report templates based on the report specifications that have been configured.